Travelling between Rotorua and Taupo won’t take that long. In fact, the distance you travel is only about 90 km. But what you will need time for, is all the stuff in-between. Of course, the key attraction would have to be the geo-thermal activity in the area. To the north, is another great attraction – the “White Island” volcano in the Bay of Plenty. And to the South, lies the Tongariro National Park, also including Mt. Ruapehu, Mt. Ngauruhoe and Mt. Tongariro. Let’s not forget the scenic along the Whanganui River. Whakarewara/ Te Puia lies just outside the central Rotorua township. In fact, this is one of the first early settlement locations for local Maori. The first fortification (Te Puia Pa) was erected around 1325 AD. Whakarewarewa has approx. 500 pools and at least 65 geyser vents. Seven geysers are currently active. Pohutu Geyser erupts to heights of up to 30 metres – its an awesome sight! Waiotapu is located about 30 minutes drive (and 27 kilometres) south of Rotorua. Many of the hot springs in this area have a striking colourful appearance. Do expect a bit of a ripe smell though. This geothermal area covers 18 square kilometres. It has been protected as a scenic reserve since 1931. An authorised tourist operation occupies under the name “Wai-O-Tapu Thermal Wonderland”. 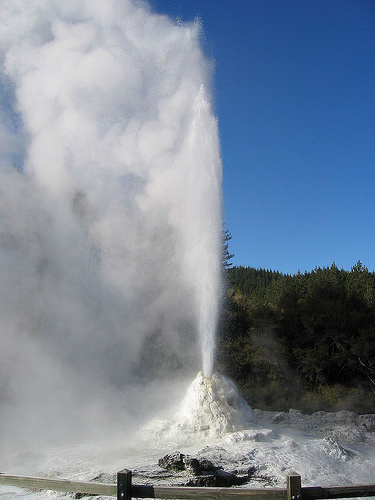 At 10.15 am daily the Lady Knox Geyser erupts 10-20 metres in height. Now you can view this spectacular sight and learn more about it in a natural setting. If you’re not interested, then I’d suggest you head off to the nearby “Champagne Pool”. Interestingly enough, you may get this one all to yourself – most tourists go to the Lady Knox show. Waimangu means ‘black water’ in Māori and it encompasses Lake Rotomahana, the former site of the Pink and White Terraces. This is also the location of the Waimangu Geyser. The largest hot water Spring in the world can be found here. And it won’t come as any surprise to learn that it is called Frying Pan Lake. There’s also a very unusual pale blue Inferno Crater Lake here. 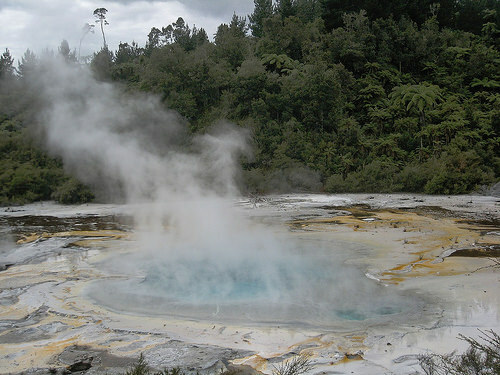 Orakei Korako is a highly active geothermal area. It is largely known for its series of fault-stepped terraces. You’ll find it in the valley which lies north of Taupo – on the banks of the Waikato River. The lowest terrace at Orakei Korako is the jade-green Emerald Terrace. This is the largest of its kind in New Zealand, with up to 35 active geysers. 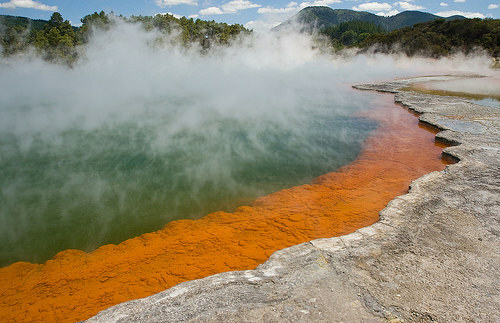 Orakei Korako remains the largest geyser field in New Zealand. The most famous of these is the Diamond Geyser, whose random eruptions eject boiling water as high as nine metres. 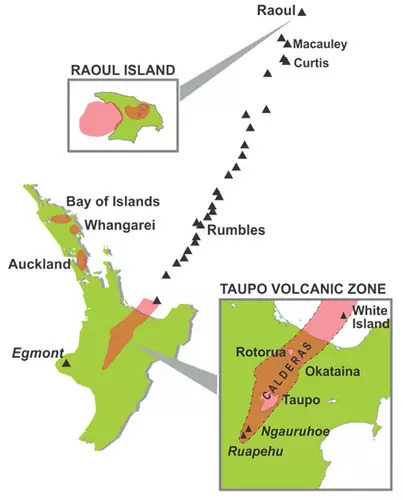 Sitting 48 km offshore, White Island (Whakāri) is New Zealand’s most active cone volcano. About 70 percent of the volcano is under the sea, making this massive volcanic structure the largest in New Zealand. 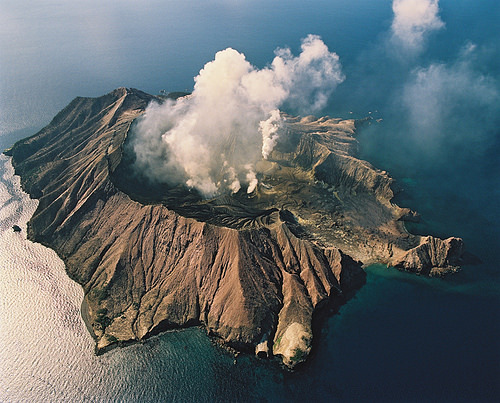 White Island became a private scenic reserve in 1953. Daily tours allow more than 10,000 people to visit every year. Take a helicopter flight ex Rotorua and do the return journey in 3 hours. This really is a must-do if you’re looking for something truly magical. The best way to explore these natural wonders is to have your own vehicle. Start in the morning from Rotorua and work your way through to Taupo. Don’t forget to visit Huka Falls, which feeds New Zealand largest river – Waikato River. Happy travelling between Rotorua and Taupo! Many of our guests are heading to the Rotorua/Taupo area after leaving Waihi Beach. We recommend they visit Waimangu or Waiotapu on the way out of Rotorua – one of them but no need to do both and we also suggest Orakei Korako for those who are not doing Rotorua. Huka falls is a must do and we explain why in case they are expecting Victoria falls or similar -it’s the immense power that needs to be see. Hey Greg & Ali, great to see you’re pointing your guests in the right direction. You’re local knowledge is invaluable for your guests. Would have liked to have met the real Lady Knox. As you say, she must have known how to have a rip roaring time. These geysers are amazing we’re very glad we’re adding to your list – i.e. more breaks away for Jane and Neil. Hi Michael….met you in the late 90’s and came to your office in Churchill with my late husband….it has been a long time since my last trip to NZ. I look forward to meeting you again….